Interesting, I assume the bonus DVD will be pressed? When was the last time there was a 4 for $44 sale? are they going out of their way to prioritize second string Minnelli over his still-languishing classics? Oh but they do love their Mitchum. I feel like WAC is more of an actors label than a directors label. Surely that’s true for the studio as a whole? Yes. Especially in terms of classic Hollywood and probably true for all the majors. 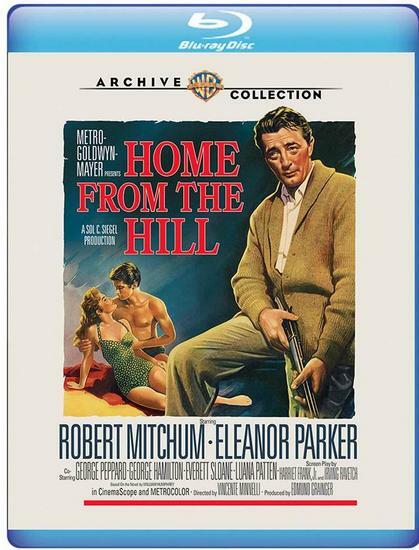 I don't think they chose to release this solely because of Mitchum, because if there's one director the WAC is devoted to, it's Minnelli, with eight total releases of his films in the line, more than anyone else, and half of those among 2018's announcements so far. I say release them all—keep them coming in any order, though if The Sandpiper is next, that will be a bummer. As always, the bias is strongly against anything before the 1950s. In the past two years, WAC has released only TWO titles on Blu from before 1945, the more recent of which Meet Me in St. Louis, had already been out from them on Blu-ray. They should really release The Bad and the Beautiful on Blu, which according to IMDb at least is Minnelli's most popular feature bar none, and it's the successful forerunner to the recently released Two Weeks in Another Town, so probably should have been upgraded ahead of it. But what can you say to a studio that won't even do anything with the Astaire/Rogers cycle on Blu-ray and have left the definitive DVD set essentially scattered to the winds? The Naked and the Dead and The Last Hunt announced as well. That restoration premiered in 2013. Warner subsequently put it out as an Archive DVD, but even that is no longer available, so there's been speculation that they've licensed it to Criterion. Hopefully their Mitchum-love will lead to a bluray of Wellman's The Story of GI Joe. There was apparently a restoration a few years back. It's an absolutely wonderful film. This was UA, so MGM right? Or did it somehow end up with Warners? UA distributed it, but the copyright was retained by producer Lester Cowan, who renewed it in 1972. The long-OOP Image DVD was licensed from "Video-Cinema Films," which sounds like the name of a PD-bandit outfit but apparently had some legitimate claim to the film (they took CNN to court for using clips in their Mitchum obit but lost on fair use grounds). The Academy Film Archive did the restoration and owns the 35mm print that's been circulating for the past few years, so maybe they've somehow obtained the rights or administer them on behalf of the owner. Can someone say anything about The Last Hunt, I haven't seen it? Damn. Sounds like legal hell. Hopefully someone can get the restoration onto blu ray. Wellman's greatest film, I think. No! Not the bees! Noooooooo!!! It's interesting to compare the kinds of films they use to attract streaming subscribers vs. the junk they usually dump into the Blu-ray line. In this trailer for the streaming platform, one can watch the clips for the entire first three-fourths of the thing before seeing a film they've released on Blu-ray (Blood Alley, The Yakuza...), even though they ostensibly selected these clips based on the kinds of films they know people want. I guess the trailer wouldn't look quite as prestigious if they put the likes of Bad Ronald in it.